The story of Ruth is filled with noteworthy characters and dramatic circumstances. We read of famine, relocation, death of loved ones, and continual striving to keep the family line intact. Throughout the historical account, we see the orchestrating providence of God. Naomi, Ruth’s widowed mother-in-law, returned to Bethlehem when she heard that prosperity had come to her native land. But her bitterness made her almost unrecognizable to the townspeople. She even wanted to be called Mara (meaning bitterness) because she blamed God for her misfortunes. Ruth, also a widow, accompanied Naomi. As the story unfolds, we meet Boaz, the kinsman-redeemer, who offered generous provision, restored lost property, and married Ruth. The happy ending includes restoration of joy to Naomi, the grandmother, through the birth of a child who is in the genealogy of David and of Jesus Christ. 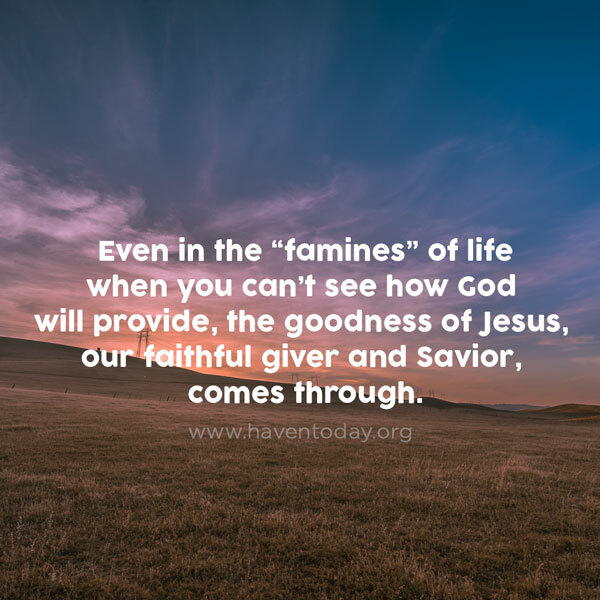 Even in the “famines” of life when you can’t see how God will provide, the goodness of Jesus, our faithful giver and Savior, comes through.